The snow trek to Kedarkantha is said to be one of the most beautiful winter treks you can do in Uttarakhand. This trek has multiple advantages: it's fairly easy and so is suitable for first-timers; it takes you into the snow on the first day itself, and it offers you a great combination of pine forests, frozen lakes, views of snowy peaks, and a whole lot of mountain living. Taking you to a height of 12,500 feet in the Western Garhwal range in Uttarakhand, this snow trek to Kedarkantha summit gives you spectacular views of the surrounding peaks, like Bandarpoonch, Swargarohini, Kala Nag, and Ranglana peak. Your route takes you through undulating meadows, snow-laden forests and sparkling streams, and has some of the best campsites of all the treks at this altitude. • Summit Kedarkantha at 12,500 feet in the Garhwal Himalayas. • Trek through snow-laden meadows and dense oak forests. • Climb to the Kedarkantha summit for spectacular views of the majestic Himalayas. • Camp in enchanting forest clearings and vast meadows. • Experience the thrills of trekking in the snow on the most beautiful winter treks in India. Participants must adhere to the instructions of the trip leader/guide at all times during the snow trek to Kedarkantha. Consumption of alcoholic beverages, drugs etc. 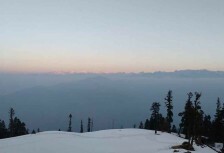 during the snow trek to Kedarkantha is strictly prohibited. For any cancellations made 24 days or more prior to the departure of the Kedarkantha snow trek: 95% of the total trip cost will be refunded minus any transaction charges, or you can use this amount to book any other trek with the same operator within a year. For cancellations made 14-24 days before the departure of the Kedarkantha snow trek: 70% of the total trip cost will be refunded minus any transaction charges, or you can use this amount to book the same trek with any other batch of the same operator within a year. For any cancellations made 10-14 days before the departure of the Kedarkantha snow trek: 50% of the total trip cost will be refunded minus any transaction charges, or you can use this amount for the same trek in the same season. 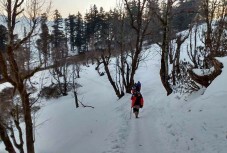 For cancellations made less than 10 days before the departure of the Kedarkantha snow trek: No refund but you can transfer the same trek to a friend. In case of transferring the snow trek to Kedarkantha to a friend, he/she should satisfy all the mandatory requirements of the operator. Participants will only be able to change their dates/batch of the snow trek to Kedarkantha depending on the seats available. The operator reserves the right to change/cancel the plans for the snow trek to Kedarkantha without prior notice if deemed necessary. No arguments or refunds will be entertained. Any event cost for the snow trek to Kedarkantha is exclusive of any kind of insurances or medical coverage/benefits. Your vehicle from Dehradun to Sankri will accommodate 7-8 passengers. You'll meet your operator early, at 06:00 hours, at Dehradun railway station. You'll board a private vehicle, shared by your trek members, and will be driven to Sankri. This 10-hour long journey takes all day, winding through gorgeous mountain scenery, and you'll get to Sankri by 17:00 hrs. You'll check in to your hotel/guesthouse, freshen up, and can head out to explore the market. Overnight in hotel/guesthouse. You'll wake up to a beautiful morning, and a hearty breakfast. After that, you start your trek. You'll leave Sankri behind and climb upwards through maple and pine forests, along sparkling streams, and over rickety wooden bridges. Your campsite for the night is on the banks of Juda ka Talab, which may be frozen over. You’ll pitch your tents close by and will enjoy a delicious dinner before retiring for the night. Overnight stay in tents. You'll wake up to a cold mountain morning and eat breakfast while you gaze out over the lake. You'll be trekking to the base of Kedarkantha today, walking through pine forests and negotiating a steep slope. As you climb, you'll begin to see the peaks of famous mountains like Bandarpoonch, Swargarohini, Kala Nag and Ranglana. Once you get to the base, you'll set up tents and enjoy the campsite. Overnight stay in tents. Day 4 of the snow trek to Kedarkantha: Summit day! You'll start after a good breakfast, and begin the final stretch of the trek to Kedarkantha. It's a gradual ascent that gets a little harder as you near the summit, but you'll be stopping frequently to take in the views. Once you get to the top, you'll have some time to explore and then will descend to Hargaon camp. You'll eat a hearty dinner tonight, and will retire to tents for the night. After a filling breakfast, you’ll begin trekking down to Sankri. En route, you'll see the valley of Har ki Dun, and will be able to stop to admire the views. You’ll reach Sankri by evening and can explore the lively market area or simply relax at the hotel. Overnight stay in hotel or guesthouse. You’ll check out of the hotel/guesthouse in the morning and will be driven back to Dehradun. You should reach Dehradun railway station by 19:00 hours. Your trip ends here. Personal expenses such as extra meals, packaged water, soft drinks, telephone calls, etc. Overnight stay in a guesthouse/homestay. You'll be driven from Dehradun railway station to Sankri and should reach Sankri by early evening. There are no meals provided during transit, but you'll be stopping en route and can pay for it yourself. You'll be staying in a guesthouse/homestay at Sankri in cosy rooms on triple/quad/dormitory basis. You'll be provided with bedsheets and pillows to keep you warm and you'll retire for the night after a delicious dinner. You'll start trekking from Sankri to Juda-Ka-Talab after breakfast at the guesthouse and you'll carry a packed lunch for the afternoon. Your alpine tents are pitched near the frozen lake and you'll also have a toilet and kitchen tent. At night, you'll be provided with thick sleeping bags and camping mattresses in your tent. You'll trek to Kedarkantha base today after breakfast and the friendly support staff will pack the campsite after you and move to the next base. You'll eat a packed lunch on the way and you'll reach the base only by early evening. You'll have a delicious dinner in the kitchen-dining tent before retiring to your cosy tents with sleeping bags and camping mattresses to keep you warm. You'll sleep under a starlit sky in a forest clearing tonight. Your campsite also has a toilet tent. Today you'll eat a hot breakfast at camp and carry a packed lunch. After your summit, you'll return to camp where a hot dinnner is waiting for you, and you'll fall into your tents for a long sleep. Overnight stay in a guesthouse/ homestay. You'll descend to Sankri today after a filling breakfast at the Hargaon campsite. You'll eat a packed lunch on the way and should reach the homestay/guesthouse by evening. The rooms are on triple or quad/dorm sharing, and have all the beds and bedding you'll need. You'll be driven from Sankri to Dehradun railway station today. While there are no meals provided today, you will halt for lunch and snacks on the way and you can order and pay for your own meals. You should reach Dehradun by evening. Your trip ends here. You can reach Dehradun by direct flight from Delhi. Dehradun is connected by rail to important cities like Delhi, Mussorie, Mumbai, Varanasi, Lucknow, and Kolkata. The operator will arrange your transport to the start point of the snow trek to Kedarkantha.